The Maclachlans were loyal Jacobites. They were said to have been present at the Battle of Killiecrankie in 1689. In the Jacobite Rising of 1715 Lachlan Maclachlan of that Ilk "signed the Address of Welcome to the Old Chevalier, the rightful King James VIII Stuart, on his landing in Scotland". Archibald Brown, in The History of Cowal, wrote, "The chief of MacLachlan appeared with the Earl of Mar at Sheriffmoor as Colonel in the Pretender's army, and for this act it is said Campbell of Ardkinglas followed MacLachlan like a sleuthhound for five years and shot him dead in 1720". Following the Jacobite defeat a Government ship sailed up Loch Fyne and shelled Castle Lachlan, forcing the chief's family to abandon their residence, and in Edinburgh the Maclachlan colours were burned on the orders of the Duke of Cumberland. It had been assumed that the chiefs lands had been forfeited for his support of the Young Pretender and the Jacobite cause, but it was ruled that he had been killed before he could be attainted. 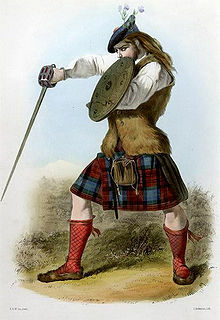 The chief of the Campbells, the Archibald Campbell, 3rd Duke of Argyll, who although helped crush the Jacobite forces, aided Donald, son of the deceased Maclachlan chief, and helped saved his lands. On 12 February 1747 Donald Maclachlan of that Ilk received a charter for his lands "at the intercession of the Duke of Argyll", though it was considerably unpopular decision at the time, and Maclachlan's estates were "surveyed but afterwards found not to be forfeited".